The ultimate multipurpose compact mixer offers great sound and lots of really useful features. The 3rd generation of the best-selling MixWizard range features a new mic preamp design and advanced grounding scheme, which both further enhance sonic quality. Other improvements include individual phantom power switches, channel signal indicators, lamp socket, and backup supply capability. Internal configuration options for channel aux sends and direct output are now on pluggable jumpers for your convenience, and the mixer is presented in a stylish new package. Of course, the range retains its traditionally strong blend of professional features, including an all-metal chassis, individual circuit boards, nutted rotary controls, smooth 100mm faders, LED metering, as well as 6 aux sends, 4-band EQ, digital FX, and expansion capability. 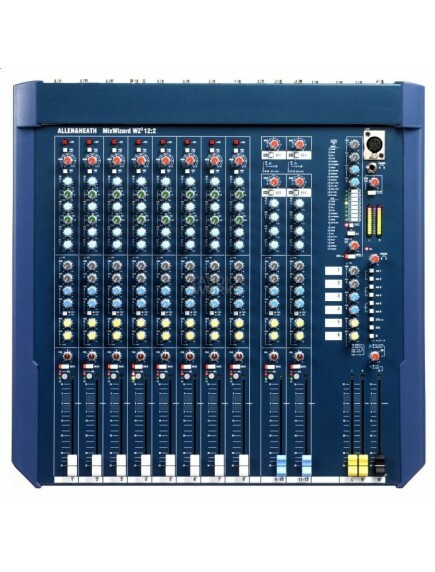 The MixWizard WZ3 12:2 Mixer desk/rackmount all-purpose console features the same functionality as its larger sister models with 2 extra dual stereo inputs for stereo sources such as keyboards or CD players. 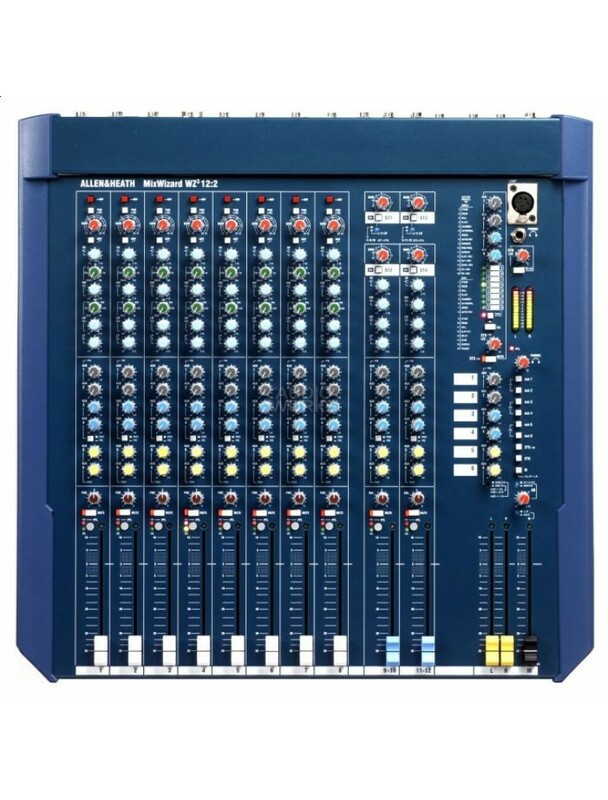 The WZ3 12:2 features 8 mic/line channels with 4-band EQ, HPF, individual phantom power, 6 auxes, mute switch, signal and peak indicator LEDs, and 100mm smooth action fader. A configurable direct out and insert using all-metal TRS jacks are provided. 2 dual stereo input channels: ST1/3 and ST2/4 inputs have separate gain and on/off controls and can therefore be selected individually or mixed together. ST1/3 inputs can be routed direct to LR for even more versatility. Main output controlled by 100mm faders with 12-segment 3-color metering with insert. A-B output for additional L&R stereo output selectable pre or post L&R faders. Unique underpanel mode switch to configure A-B as a local monitor output for additional stereo monitoring. Mono fader feeds mono XLR output. Source select L+R sum or aux 6 mix for creating separate mono/C or aux fed sub mix. 6 auxiliaries: 1-2 prefade (option: link to follow pre/post switch), 3-4 switchable pre/post fade (option: permanently prefade) and 5- and 6 post fade (option to follow pre/post switch). Internal option to configure stereo channel L signal to odd auxes and R signal to even auxes. Aux masters are rotary controls with TRS outputs. The aux busses can be monitored in mono or related stereo pairs. Mono channels have separate controls for sweep and cut/boost on mid bands. HPF @ 100Hz is switchable. TRS line inputs, routed via level controls to L&R mix. ST1 can feed aux 1-4. Note: the internal FX returns to ST1. The ST1 input allows external FX to be mixed in. 32 FX programs with external midi editing/control. Can be configured in single mode (16 programs fed from aux 5) or dual mode (8 programs fed from aux 5 plus another 8 programs fed from aux 6). FX are returned via ST1 to the mix, aux 1-4. The effects can be muted using a footswitch. WZ FX editor software is available from the Allen & Heath website. Headphone output and local monitor possible, with separate level controls. Red led indicator when PFL on input channels is selected. PFL signal overrides the selected monitor source and L&R metering. A-B output can be configured as local stereo monitor. All the features and functionality you need in one compact desk. Order today!